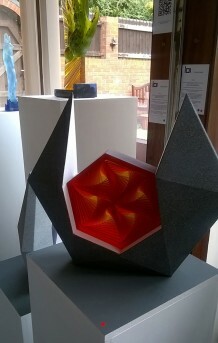 My fellow Teepee artists and I have just come back from a weekend in Stourbridge in the Midlands to see the Glass Biennale at the International Festival of Glass. 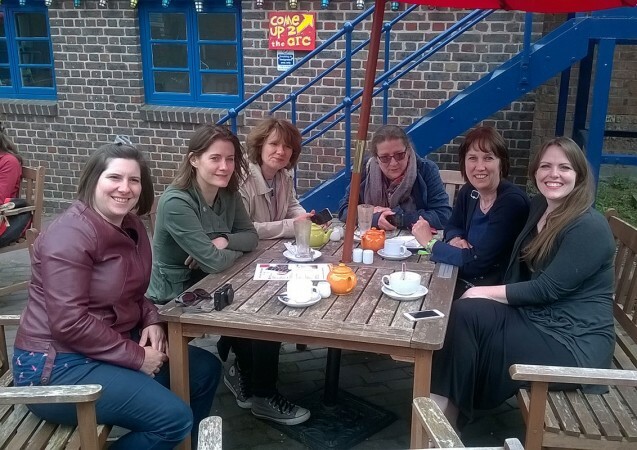 As the name suggests, this has always been held every two years since 2004 until last year when it was put on hold because the building that housed the exhibition at the Ruskin Glass Centre needed renovating. 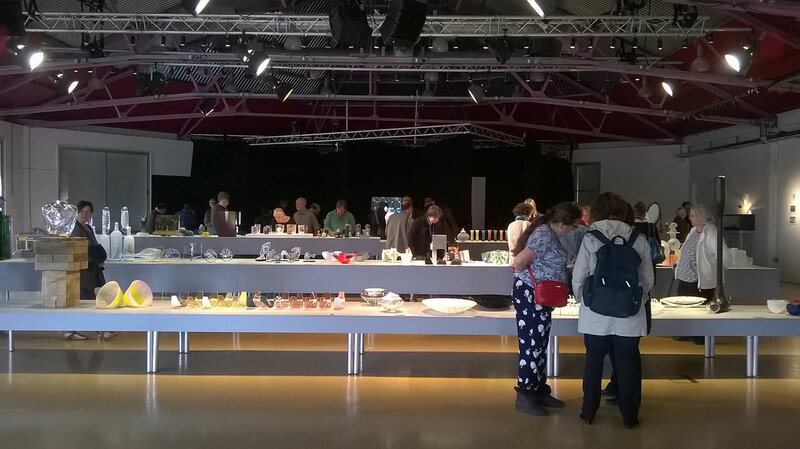 Having become a regular fixture in the glass calendar, the Glass Biennale at the International Festival of Glass was always looked forward to on the August bank holiday weekend, but for some odd reason the new director this year decided to hold it instead in May. We were told this was so people didn’t have to wait a full three years before the next one but, frankly, this seemed an unnecessary complication. We would have rather waited the extra three months to see the glass in the sun. So it could have been the occasional drizzle and cold or it could have been the tighter hold on the finances by the new director, but somehow the whole festival felt a little flat. I was not alone in finding the layout of the Glass Biennale exhibition a little strange. 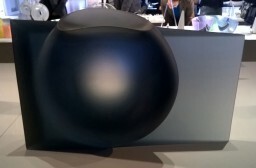 There seemed to be very few wall panels, and also a surprisingly high proportion of object based work, but I felt that the three long tables with objects squeezed onto them didn’t really present the glass in its best light. Curator Matt Duran had apparently explained to the audience at the private view the night before that the layout was meant to be read as a kind of stage set, and I could understand this while we were sitting on the chairs that had been laid out like an audience for the glass show. However once I stood up and walked around to actually look at the glass, it felt more like a table sale with pieces jostling for space. Despite what I thought was a great shame that each object had not been given space to breathe, there were some interesting juxtapositions set up because of the proximity. One area on the tallest table was given over to glass which looked more like archaeological artefacts that had just been dug up and brushed down. 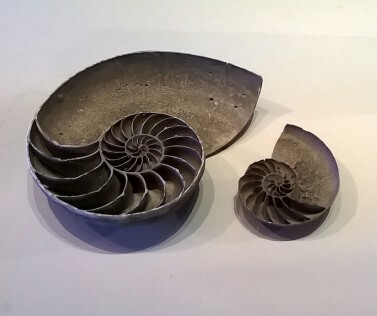 Rachel Elliot’s ammonite form ‘Crude’ was lovely and quite different from what she normally makes. 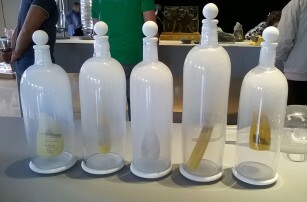 I also really loved James Masktrey’s “Shackleton’s Scrimshaw” which were five bottles which looked like they were filled with sea mist and Shackleton’s historical documents suspended inside. 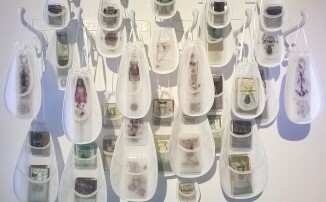 The concerns with history and memories were echoed in Lisa Catherine Sheppy’s suspended ‘Lost Pockets’ which hung screenprinted and fused glass nuggets in sheer organza pockets. I also really liked the overall winner of the Biennale, a gorgeous cast piece by Ashraf Hanna that I just wanted to stare into and immerse myself in its depth of colour. 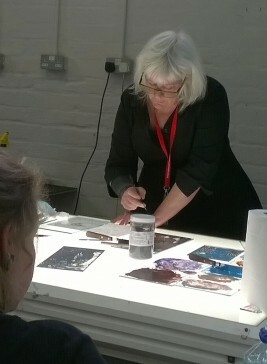 We wandered around the Ruskin Glass Centre in the afternoon, watching a painting demonstration by the delightful Cappy Thompson who had run a masterclass earlier in the week and listening to a choir who sung harmoniously as the sun came out. We saw Georgia Redpath’s lovely installation which showed the four stages of making her complex cast pieces and then had a chat with her in her studio, admiring her work. 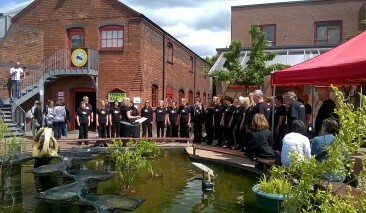 We had lots of other places in and around Stourbridge to visit as part of the International Festival of Glass. We saw an engraving exhibition at the Red House Glass Cone after which we sat outside for a chilly cup of tea as actors in historical dress finished their work showing visitors round the museum and headed home in full costume. 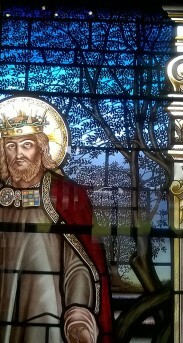 Following this, came a Church Crawl, visiting various churches in the area for their own wonderful stained glass such as this example from the Wordsley Methodist Church. 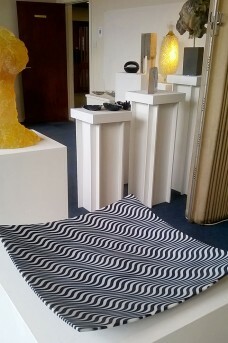 In fact in the back of the church there was an exhibition run by Bruntnell Astley. Putting on an exhibition when one is a photographer, as Simon Bruntnell is, must be made easier by the fact one has so many wonderful images to choose from. It seems as though Simon was making a good job of it as he had sold quite a number of pieces, possibly more than at the Biennale. Many of his artists were also showing at the Biennale, including our old friend Nicholas Collins. We spotted a wonderful Georgia Redpath piece that had sold – it was being shown with a cardboard base, but there were arrangements for the base to be cast in bronze later on. 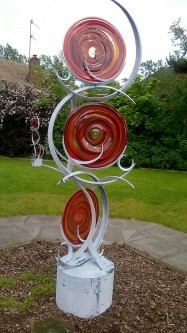 The exhibition continued into the garden where there were some grand Jenny Pickford glass and metal sculptures. 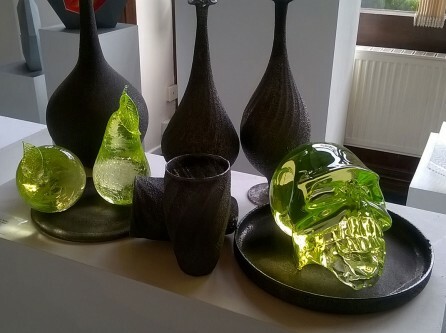 My favourite pieces of all were a delicious collection of objects by Elliot Walker, darkly textural black blown shapes, and a glass skull cast in a delicious lime green glass. On Sunday we had just enough time to squeeze in a dash around another church despite the imminent baptism that was about to happen and a lecture back in the Ruskin Glass Centre before lunch. 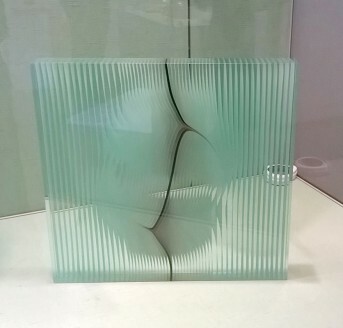 Before setting off back to London we went to see the exhibition of contemporary Hungarian Glass. A small but perfectly formed exhibition, we were debating between us how Péter Borkovics made his wonderful cast piece when the curator suddenly popped up in our midst and explained the technique in terms that made it seem almost simple compared to our convoluted imaginationary methods. 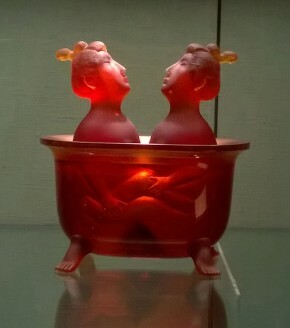 We marvelled at the skills required to make ‘Japanese and Chinese’, a rather saucy depiction of two figures in a bath. 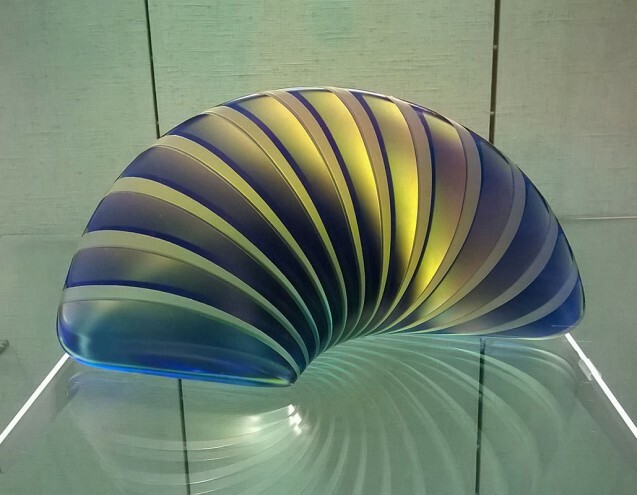 I fell in love with a smooth jewel-like curl of cast glass by Lazslo Lukacsi, and its subtly irridescent surface inhabited my dreams as I snoozed in the car on the long journey back to London.